THE SPOTTED HARE: It's Wild Hare Wednesday ! It's Wild Hare Wednesday ! Oh my, the Wednesdays seem to roll around quickly. I guess this is how the days, weeks, months and years get past us in a blink! twigs and "amber waves of grain" ! 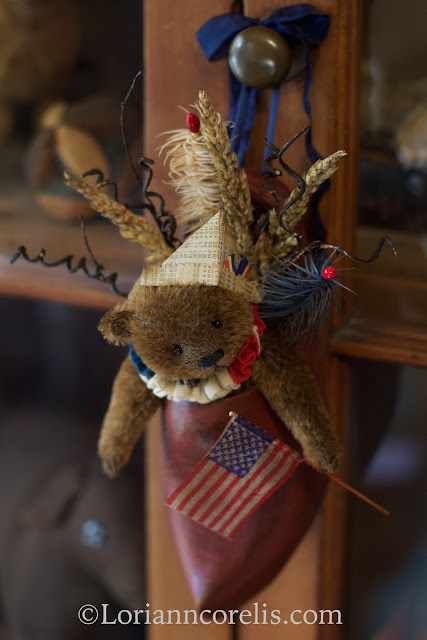 Overall: from Ribbon top to shoe toe 11"
Shoe - 8" & Teddy 6"
with a ruff of antique flag bunting, custom paper hat and vintage flag. 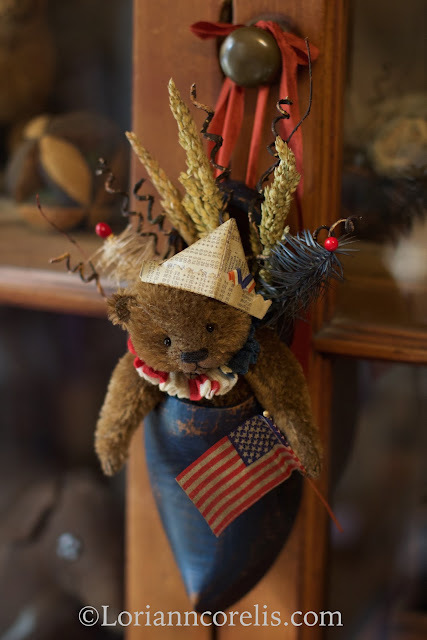 feather sprigs , twigs and "amber waves of grain" ! Shoe only - 8" & Teddy 6"
I just love Hip Hip and Hooray, Lori Ann! So glad to see you back at your creativity. Hope your leg is coming along faster and faster! Hugs from Colorado!